Blockchain is about to reengineer every aspect of our lives, upgrading the way we connect and exchange value. An idea that sprung in the early ‘90s among the cryptopunks, gained popularity in 2008 with the introduction of Bitcoin, its first application. Decentralised databases, cryptographically connected to one another, replicable on all network servers, can commoditize transactions. Blockchain removes the need for intermediaries by eliminating the problems of existing technologies, alas complexity, human errors, and slowness. For any type of organisation such ills translate into increased costs, delays, and negative customer feedback. Blockchain has the function of maintaining distributable ledgers of all transaction details, preserving the anonymity of the participants and the assets in the exchange. Miners safeguard these networks, while reconciliation all records and information on the ledger, removing corrupted transactions and preserving the integrity of the system. Compliance in the blockchain is a precursor to everything else, enabling, and commoditizing trust. The financial sector, a natural vertical for blockchain technology, has already started to adapt and scale applications in asset management, specifically, trade processing and settlements. The encryption of records on the blockchain ledger, and the continuous reconciliation process of all transactions across the network means that human error, and the requirement of intermediaries like brokers and custodians is considerably reduced. The most popular application to date of the technology rests with Bitcoin, as its value rockets at an unprecedent rate, breaking the $5,000 ceiling. 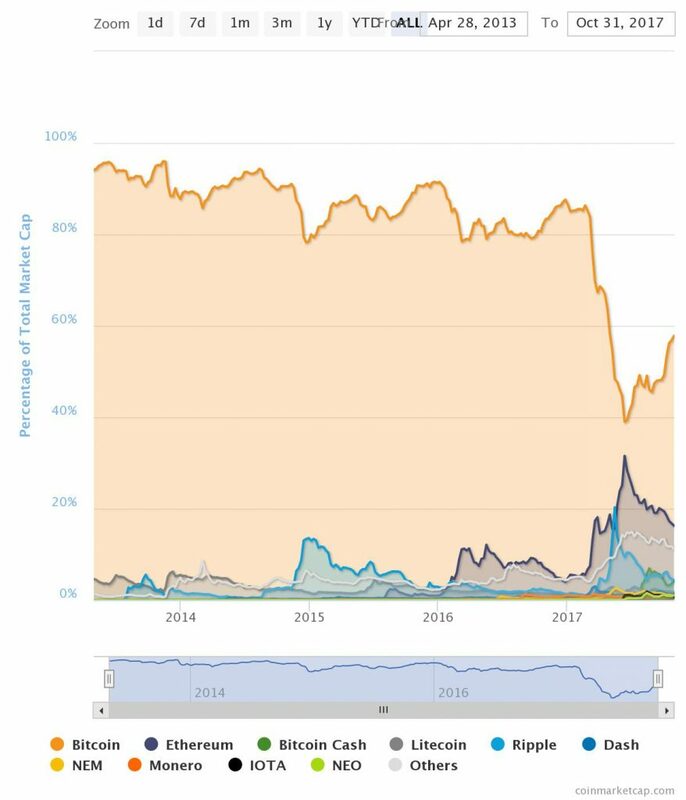 Cryptocurrencies landscape is substantially more diverse, with over 1,100 such currencies in circulation, and a total market capitalisation of $163bn. This is a concentrated market driven by the top five currencies (Bitcoin, Ethereum, Steem, Ripple and Litecoin) which have a combine 94% share. These programmable currencies have the potential to do so much more, to enable organisations and institutions across the board to allocate budgets which can be spent on pre-determined services and goods, expanding thus the reach of the blockchain. This leads naturally to the introduction of Smart contracts where exchange of money, property, shares, or anything of value in a transparent, conflict-free way, is possible. Thus, enabling the embedment of defined rules and penalties around an agreement, and, also, automatic enforcement of prescribed obligations. Square, Everledger, Hedgy and iZettle are few of the companies integrating such enterprise solutions. Blockchain is evolutionary in nature, morphing into different verticals and sectors. Enabled by secure mesh networks with stringent protocols, IoT devices can interconnect in a reliable and secure way. This is particularly relevant considering the projected 20 billion connected devices across the globe by 2020, powering a market that will be worth over $3 trillion. Filament, Testra and Change of Things are just few organisations testing the myriad of blockchain integration with IoT devices across multiple sectors. Blockchain is leapfrogging into public sector applications, especially, around verifying, managing, and protecting the identities of the individuals and ownership, especially in African and Asian emerging markets. Georgia, Sweden, and the Ukraine are working on modern real estate solutions and land registries where inefficiencies and corruption can be eliminated. Estonian government is leading the way by introducing e-citizenship, Public Notary and the option of transferring medical records of citizens into the Blockchain. London Co-Investment Fund has backed organisations such as VChain, providing digital verification of unhackable passenger data for Airlines without data exposure, showing the versatility ingrained in the technology. Distributed ledgers can benefit everything, from farming, to insurance, to education, and its potential has not gone under the radar, as VC investment has increased significantly over the last few years, reaching a total of $1.9bn, over $600bn in 2016 (Coindesk source). We are living and witnessing the paradigm shift. Blockchain is one the new technological solutions that can lower the level of uncertainty in the economy. Arguably, by collapsing institutions and intermediary involvement, reducing the need for enforcement across mediums of exchange. Human activity can get collateralized and automated increasing speed, and reducing costs. Blockchain is not a cure-all solution, unchallenged by security and regulatory influence. It does, however, foster a collaborative culture, where transparency and public ledgers have the potential to augment our trust-based relationships.